JC re: Vista Ramona. 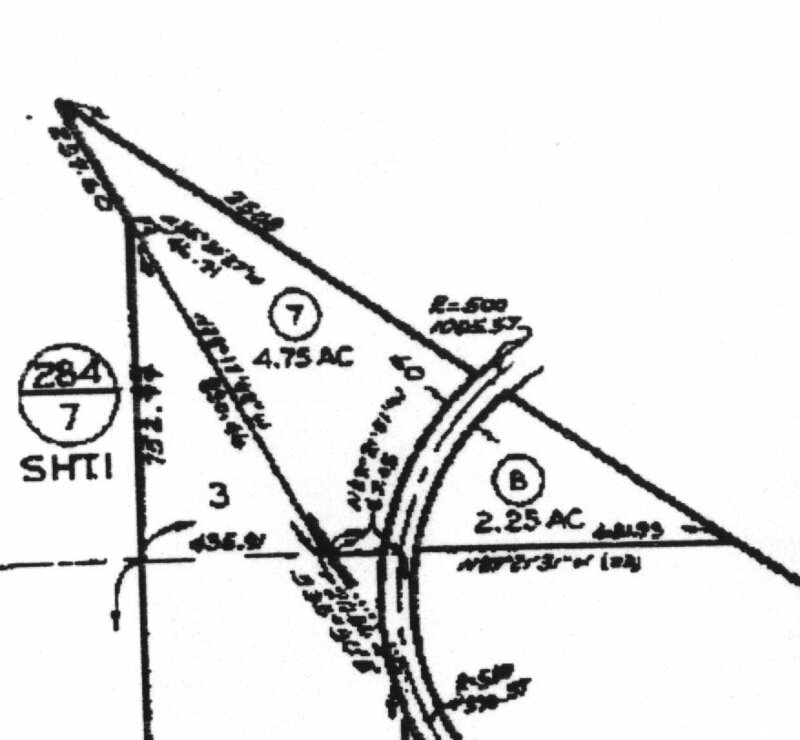 77k for 7 acres, if sold as one lot. There are two parcels, and if sold separately, subject to county zoning, the high side will sell for 75k and the low side for 55k. If the lot can not be split, then 77k for both parcels. This lot was the last of the Scarberry Ranch, and was being sold because matriarch of the family was ill. To care for her through MediCal and MediCare, the family had to divest the last of her property to allow her to qualify for government health benefits. The land consisted of two triangular parcels. The larger parcel was on the northwest side of Vista Ramona road, on the side of Mount Ramona, and the smaller parcel was on the southeast side of Vista Ramona Road. The smaller parcel had a creek being fed by four other creeks on the upper parcel, and water was running when we looked at it. The creek ran down the center of the lower parcel. The parcels could not be split under their current zoned status. Both parcels were required for the acreage to reach the minimum standards required by the county. This lot’s history goes back to the original Spanish land grants. JC’s office to sign offer. Offer signed. JC will call Art to arrange a grading site inspection. Picked up plan books from Accudraft. We chose a floor plan. Andrew (general contractor) and JC met at the building site. Andrew will contact the grader, well digger, and SDG&E (power). JC will take care of the percolation test and the survey. Call Accudraft to schedule a meeting between them and Andrew. Got Lan’s stash of decorating magazines. Ask Andrew about Avonite countertops. Design problem: front windows need to be modified due to the earthquake code. SDG&E will be out Tuesday. Do we want or need a paved driveway? There is a house on Del Amo road between Magellan and Corte Madera that looks similar to our plans. It looks good! Ask the well digger if he tests our water. JC says our escrow instructions on the Mussey Grade offer haven’t been received. We need to check so we can transfer $1000.00 from the first escrow to the new escrow. The seller has signed off. Escrow instructions delivered to JC. We went to the land, selected a building site, and showed it to JC. JC informed us that the across-the-street neighbor may have his septic field encroaching our property. We will wait for the official legal description from the county to be sure. We may be able to get some consideration from their builder or their title company. We chose a site on the upper lot. The lot sloped gradually up from the street, then steepened, leveled off, and steepened again. We wanted to site the house about 350 feet off the street on the upper level portion. Two creeks ran on each side of the property, and we felt that the driveway could run between the creeks with adequate clearance, and enough room to bend the driveway into a return. I didn’t want a straight driveway; I wanted a sharp enough curve so that we could plant trees to form a line-of-sight barrier to the road. This would mitigate the noise of traffic. The creeks diverged as they went up the hill, so there was room for the driveway to bend. A third creek cut through the upper steep section and joined the first creek about where the lot climbed too steeply to consider putting a house. A fourth creek joined the second creek near the bottom of the lot, and sectioned off about a lower right third of the parcel. A fifth creek cut across the extreme southern edge of the property. 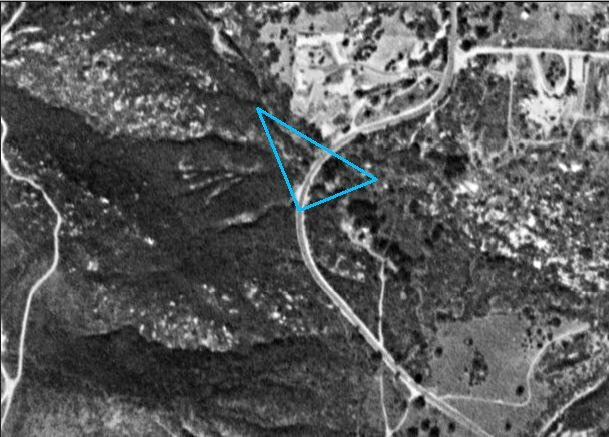 JC seemed surprised at our choice, and seemed to indicate that he thought we would put the house near the road in the lower left third of the parcel. We bushwhacked to where we wanted the house: far enough from the road to mitigate the noise of traffic and high enough to see across the valley. We gave up a full-on view of Mount Cuyamaca available in JC’s choice, but gained a high valley view with ours. The house would also be at the same altitude as the nearest neighbor, so we wouldn’t have someone looking down on us. Called Andrew – he is meeting with SDG&E and the fire department on Thursday at 12:30 PM. We will meet him at the property to show him our proposed building site. Jeff Brumfield approved our loan based on $182,000 plus $20,000 cash, for a total of $202,000. Development Costs as of 3/20/98, worst case scenario. Our GC Andrew seems to have a good grasp of our requirements, as well as experience in working with starter-home buyers. He says he can build the plan we showed him for $75k, including school fees and not including any of the above development costs. He says he also can run the well pump from a generator, so we wouldn’t have to wait for SDG&E. We need the water available during construction for fire protection. On the encroachment issue, JC’s attorney says not to promise or imply that we will receive compensation. JC will find out what type of title insurance they have. JC will visit them this weekend and advise them to contact their title company. Cost of drafting plans: we pay 50% down out of pocket. This is rebated at the close of escrow. The remaining 50% is paid out of the construction loan. Where does the HVAC go? In the roof? Can Andrew build it for $75k? We can save by cutting out the garage and a bay window, and landscaped terraces. We set up a meeting between ourselves, Andrew, and Accudraft. Andrew wants to see the property. SDG&E overestimated the cost of bringing in power, according to a company friend of JC’s. Final cost is more like $5 - $7k. $8 per foot for 600 feet. Total for drilling is $5275, still requiring a tank and a pump. As of 6/1/98, the price will go to $9 per foot. Is foundation raised or slab? We don’t want any water lines buried in the concrete. We want the water lines to be copper, not plastic. Andy called. He wants the fire department to do a preliminary report. Do they require a holding tank? Probably, yes. Well pump to the tank required, and a booster pump to the house required. How many feet of leach lines required? JC says to figure $10 per square foot, including the septic tank. The requirements should be stated in the perc test. We need a topographic map. Jeff Brumfield needs our 1997 tax return, and all paycheck stubs. New Dimension Homes is a pre-approved builder. He needs preliminary, not final, plans from Accudraft. He needs just enough information for an appraisal. JC will be taking the percolation test guy (Gary) out to the site tomorrow. Gave refrigerator dimensions to Accudraft. The layout may require the driveway to be off to one side. He (?) can work down the front, and complete by next Friday, weather permitting. The zoning is agricultural, which allows more leeway in driveway construction and outbuildings. Andy has put a $90,000 swag into the building budget. Andy wants us all there for the fire department inspection. Met with JC to wrap up due diligence. We need to clarify with Accudraft and Andy our time frames for county plan approval, building permits, and construction completion. Chris is still on the property. JC will write a letter extending the due diligence period until a week from Monday. It probably won’t be enough time to get Chris off the property, but JC will write something in the close to get Chris out of there. Chris was a Scarberry family member. He had pulled a trailer into the lower lot, where it was not visible from the road. He had run a soil pipe directly into the ground, and had placed a series of barrels on the uphill side of the lot, connected by piping, delivering water to the trailer. He lived the simple life and was reluctant to move. Per JC, the fire department mandated a sprinkler system, holding tank, hydrant hookup, a 16’ wide driveway with a 24’wide turnaround, probably surfaced with decomposed granite. We need to grade the site pad and stake the driveway location before he can say whether or not the driveway needs to be paved. It is useless to do the site inspection prior to grading. The fire department wants to see the building plans, and then will give us a preliminary approval. This information was called in to Andy. Kerrie from escrow has our due diligence amendment ready to go. It requires both our signatures. JC is meeting with the neighbor’s builder to discuss the possible encroachment issue.